If you think a whole month is far too long to wait for your next installment from CQB Radio then you’re in luck, our friend Carp has just launched his first mid-month MiniCast. If you're just too "ignant" to guess, it's a shorter version of his regular, full-length shows with some twists. Check out www.cqbradio.com for info on how to listen (iTunes podcast download or online streaming). Carp's also got a YouTube, Twitter, Facebook, and Skype account, so check him out there as well. *Speaking of items you can buy for cheap, have you checked out Pyramyd Air's Pre-Owned Gun Section? NO?!?! Do you like sweet deals on quality Airsoft treats? Thought so. A lot of their stuff is still in super good shape, but the box might be too damaged, or just opened for them to be able to sell the item at the regular retail price. If you ever had a question on any particular used item, you can always just give them a call or send them an email. Check Pyramyd Air for their contact info. In other news, Echo1 released a teaser pic of their new AR, the ER-16. That picture is comprised out of a bunch of colored Airsoft BBs. That's what. 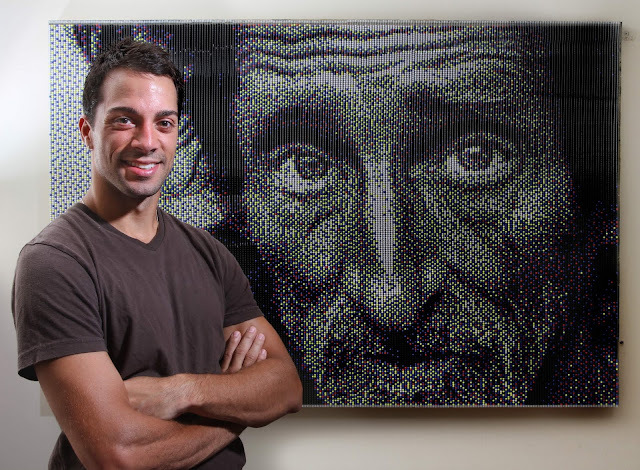 Apparently he's (the artist, not the hobo guy in the BB picture) some dude from Florida who has artistic talent using my favorite 6mm plastic spheres. His name is John O’Hearn and he's a fine arts graduate from the University of Florida. Google him for the article about his fresh-to-def style of art. Word. That wraps up my news update for now. Expect another review to be coming up very shortly. Love you.